Water is one of the biggest threats to stone surfaces. Freeze-thaw, erosion and repeated exposure to water may slowly cause the stone to start breaking down and eventually compromise the integrity of its surface. Sealing the stone can improve the ability of the stone surface to resist water and other elements that weaken, stain and soil them. Moreover, you wouldn't need aggressive cleaning detergents to remove the stubborn stains as well. 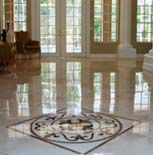 Stone surfaces such as Marble, Granite, Limestone and a others are a substantial investment. It is not something you would remove or replace so easily. Getting a stone sealing in NYC from a trusted stone company, like Statewide Stone Care, can help protect your stone surfaces so that they can remain in great shape for a longer period of time. Common stone surfaces such as porcelain, travertine, sandstone and many more require a sealing for which they usually have holes where dirt and water may hide and slowly lead to the deterioration of the natural surface. Stone staining comes from the penetration of oils or other liquids, which once upon the stone surface can make removing them without damaging the stone difficult. This occurs when salts are dissolved in water and enters into the porous surface. The salts expand and cause a gritty white deposit on the surface, which is called efflorescence. The minerals deep in the soil are then drawn to the surface, reacting with the salts. On other occasions, the water freezes inside the pores and expands, which results in the stone becoming cracked. Stones like limestone, sandstone and travertine have extreme reactions when coming into contact with acid. These effects include leaving dull marks on the surface, pitting and gradual erosion. Mild household acidic solutions such as vinegar, cola, wine and lemon juice can be harmful to some types of stones with some damages being irreparable. Statewide Stone Care's professional stone sealing in NYC starts by cleaning the surfaces to dislodge any dirt that might be hidden deep in the pores. Once the surface is dried, a sealant is applied on the face of the stone, keeping your surface protected and resisted to the toughest of spilling. Our stone experts at Statewide Stone Care use state-of-the-art sealing products to ensure that your stone sealing in NYC is done precisely and effectively. For more information about our stone sealing in NYC, contact Statewide Stone Care at 1-888-574-5595. Statewide Stone Care - Your trusted provider for Stone Sealing in NYC.